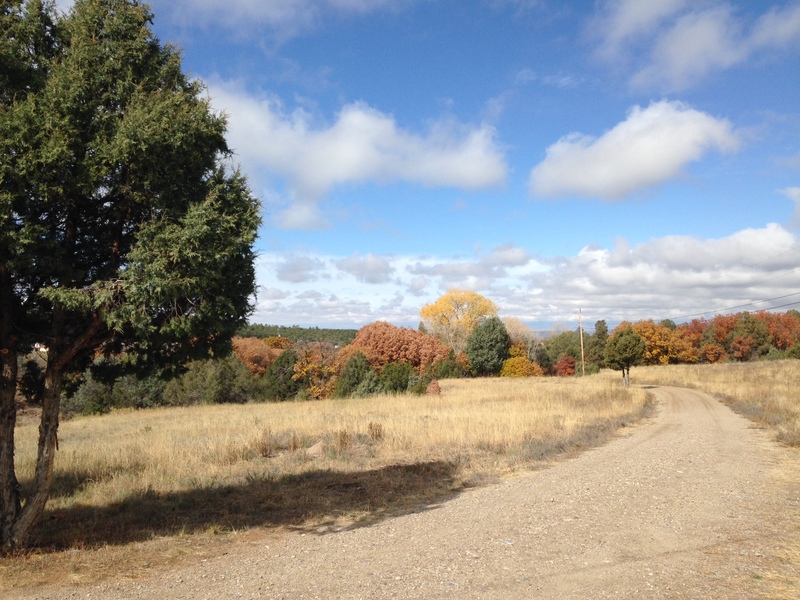 The High Road begins in Pojoaque, then passes through the towns of Nambe, Chimayó, Córdova, Truchas, Ojo Sarco, Las Trampas, Peñasco, Vadito, Sipapu, and finally Taos. Along the way are no less than 50 small galleries and shops displaying the art of local artists. Our intention was to stop at several galleries along the way, but we found that many were closed (or just seemed empty) on the day we were driving through. 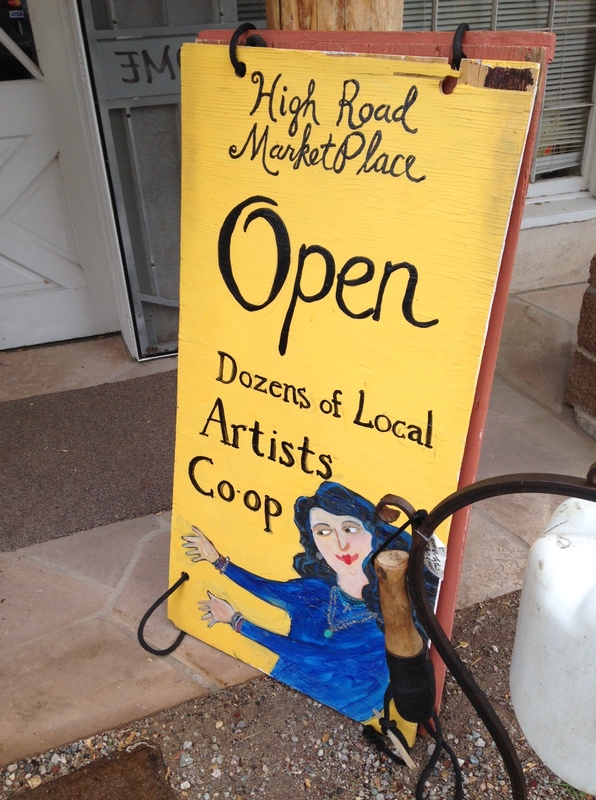 One place we did stop and browse was the High Road Marketplace in Truchas. This shop displays the art of many artists in a variety of media — paintings, ironwork, gourds, etc. We then visited the gallery of painter Charlee Newman in Ojo Sarco. Her oil landscapes and pastels of wildlife were stunning and we all left there wishing we could afford to take a few home with us. Also, the gallery was on her private property, and we were shown around by Ms. Newman herself. In true EatingNewMexico style, we all noted that whatever she was cooking up for dinner smelled REALLY GOOD. Smelling whatever was roasting on the Newman property got us all pretty hungry. So we checked our maps and decided to stop and eat in or near Peñasco. According to Yelp, a little place called Alicia’s Café was nearby and open at the right time and claimed to serve New Mexican food. So we aimed ourselves at it, in hopes of some Enchiladas with Red. You know how it is when you just NEED some red. That’s where we all were. So, all the map apps LIE. After being sent way out of the way by both Apple Maps and Google Maps about 4 times (with a loss of about 30 minutes), we were all starving and ready to get our grub on. We searched and searched. We were ready to give up. We pulled into a parking lot to make a final U-turn and just get the heck out of dodge and try our luck in another town. HARK! An old building with a kind of skeezy sign out front reading: New Mexican Food. I honestly don’t remember the name of the restaurant or really much about it other than that we walked in and all said, “Nope.” Meaning, let’s just tend to our blood sugar then get out of here. There was something off about the feng shui or something, but we all knew immediately we didn’t want to spend a whole lot of time there. We ordered chips and salsa (very yummy) and chile-cheese fries to share around the table. The waitress informed us that the restaurant actually used to be Alicia’s, which we had been looking for all along. Ah, evil irony. We didn’t take any pictures of anything to write a real review, which is unfortunate because the red chile on the fries was SUPER good. We finished up quick and got back on the road. I think we all would have liked to have spent a little more time on The High Road, meandering along, walking through galleries. I think the best bet here would be to take one of the organized tours (offered here via High Road Artisans) to ensure the most galleries will be open, and that you won’t be the only person walking through someone’s home/gallery, looking through at their stuff.